Union 2077 horizontal 3 lever door lock for period properties. Available in 5inch (124mm x 70mm) & 6inch (149mm x 70mm) lock case sizes. 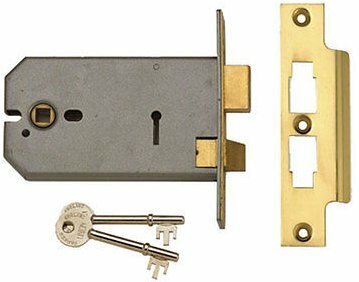 5inch lock has 4inch (101mm) backset to centre spindle, and 38mm backset to key lock. 6inch lock has 5inch (127mm) backset to centre spindle, and 51mm backset to key lock. Supplied with keys with brass or satin chrome forend and strike plate. Locks can also be keyed alike if required, please call for details.